Education | Macon County Health Dept. Growth and education is the key to a happy and healthy life and for that reason, the Macon County Health Department offers educational classes to keep you informed. We are dedicated to offering a wide variety of classes to best serve the Macon County area. Our commitment is to promote individual, family, and community health. Check out the calendar for frequent updates and additions to our course offerings. Our Breast Feeding Peer Counselor/Certified Breastfeeding Specialist, hosts breastfeeding classes to help mothers or mothers-to-be prepare for the ups and downs of breastfeeding. It is our goal to prepare you for breastfeeding, offer techniques and strategies, manage your concerns, provide support and resources, and help you balance your time between work and breastfeeding. This class offering is FREE. We have a Breast Pump Loan Program that brings a valuable resource to the community at no charge. Please call 660-395-4711 for a schedule and availability, or to speak to our Breast Feeding Peer Counselor about the Breast Pump Loan Program. The Macon County Health Department Car Seat Program provides information on the importance of car seats and safety. Our qualified technicians instruct participants on the proper installation of car seats. It is our goal to ever increase child passenger safety. Expectant parents are encouraged to contact us about this program before the baby’s arrival. 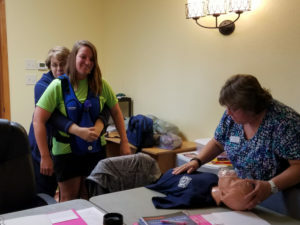 Macon County Health Department partners with the Department of Health and Senior Services through the Maternal Child Health grant, the Missouri Department of Transportation, and, the Coalition for Roadway Safety to provide these services. This service is offered FREE and car seats are available to those who qualify. Please call 660-395-4711 for a schedule and availability. Macon County Health Department staff provide instruction and support to those with chronic disease and those with the onset of chronic disease to lead a better quality of life. Nutrition and lifestyle counseling provides guidance to improve health to reduce or minimize the effects of chronic disease. Where appropriate, we discuss the use of exercise to maintain and improve strength. This service is FREE. Please call 660-395-4711 to schedule an appointment. Courses offered are: Basic Life Support for Health Care Provider, HeartSaver First Aid/CPR/AED, HeartSaver CPR/AED and HeartSaver Pediatric First Aid/CPR/AED. Each participant will receive a student workbook for the appropriate course and after meeting all requirements they will receive a 2 year certification through American Heart Association. There is a cost for these courses. Please call 660-395-4711 for a schedule and availability. These courses may be completed online at onlineaha.org (charges per AHA guidelines). Participants will need to print off completion certificate and complete a skills check off with our trained staff to receive their certification card. There is a cost for the skills check off and certification card. Please call 660-395-4711 for more information. Basic Life Support Instructor Courses thru American Heart Association are offered as well. Please call 660-395-4711 for more information. The Macon County Health Department works with area schools to provide routine food safety inspections. We offer consultations and further technical assistance for children’s health, safety, and nutritional needs. Our trained staff works to ensure collaboration on issues impacting the care of children in Macon County. Please call 660-395-4711 for more information. The Macon County Health Department works with licensed day care and childcare providers. 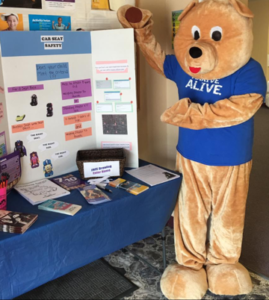 We offer area providers clock hour trainings, health promotions for the children, and consultation and further technical assistance for children’s health, safety, and nutritional needs. Our trained staff works to ensure collaboration on issues impacting the care of children in Macon County. Consultations are FREE. Please call 660-395-4711 for a schedule and availability, or click this link to our clock hour’s calendar. Early prenatal care is important during pregnancy for your health and the health of your baby. The Macon County Health Department offers confidential classes regarding comprehensive prenatal care, education and counseling. As part of our prenatal course offerings, we provide referrals to Macon County resources, WIC referrals, and additional information about nutrition and what to expect during your pregnancy. Additional prenatal classes include breastfeeding classes, our car seat program, our safe cribs program, and more are listed on this page. These class offerings are FREE. Please call 660-395-4711 for a schedule and availability. The Missouri Department of Health Safe Cribs Program ensures parents are educated on safe sleep for their infant. Expectant mothers may apply to be a part of the program from 35 weeks through the birth of their baby. Eligibility is determined by need through this application. Eligible parents will receive a pack & play and will be shown how to safely set this up, they will receive safe sleep information, and be required to participate in a home visit four to six weeks following the birth of the baby. This program is FREE. Please call 660-395-4711 for a schedule and availability. Smoking is the number one preventable cause of death in the U.S., killing over 480,000 people per year according to the American Lung Association. They report that secondhand smoke kills more than 41,000 people in the U.S. each year. Are you serious about quitting? The Macon County Health Department provides smoking cessation services that include behavioral counseling to ensure your success and improved long-term health. This class offering is FREE. Please call 660-395-4711 for a schedule and availability.